FINANCE Minister Simon Hamilton MLA has said that there is a need to reassess and reinvent the role of government in growing the economy. The Minister was addressing an audience at the Northern Ireland Chamber of Commerce’s President’s Banquet which focused on celebrating Northern Ireland’s creative industries. The event was held in the tourism flagship of Titanic Belfast. Simon Hamilton said: “Creative Industries and tourism are two parts of the new economy we are building in Northern Ireland which will sit alongside the ICT financial services, advanced engineering and agri-food sectors that are already driving forward our economic recovery. “However, a sector that isn’t considered part of our economic future is the public sector. It’s one thing that government ensures that the skills we need to compete in the global fight for investment and jobs are provided for through our universities and colleges or government backed training programmes. Or that government invests in infrastructure like the A26 or new regional children’s hospital that provides a pipeline of work for our construction industry. 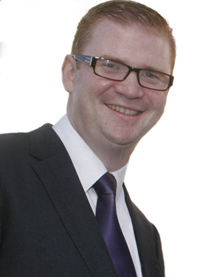 Finance Minister Simon Hamilton MLA has presented a new view on remodelling the shape of the state. The Minister continued: “Critics of government would often refer to us as big, bloated and bureaucratic and something that is an impediment to economic growth. It would be very rare that we would be described as innovators, investors or risk takers. “But that’s exactly what our government frequently is. Would the private sector alone have built Titanic Belfast? Without the almost £50 million of public money invested, it’s unlikely this venue and the benefits it brings would be a reality. “HBO are here in Northern Ireland in part because of government assistance through both Invest NI and tax breaks as well as the public investment in the Paint Hall. “There is ample evidence of government – especially in Northern Ireland – intervening early, developing an enabling environment, de-risking strategically significant projects and creating the conditions for business to flourish. Referring to public sector reform the Minister added: “We shouldn’t be afraid of our public sector. Instead we should embrace its potential as a driver of the economy. As an entity that can inspire innovation and entrepreneurship. “I firmly believe that a reformed public sector is one of the cornerstones of a vibrant and dynamic economy. Entrepreneurial governments attract investment. Enterprising governments produce enterprising economies.